7 Isaac spoke to Abraham his father and said, “My father!” And he said, “Here I am, my son.” And he said, “Behold, the fire and the wood, but where is the lamb for the burnt offering?” 8 Abraham said, “God will provide for Himself the lamb for the burnt offering, my son.” So the two of them walked on together. God has been exposing the many idols I covet lately. And they are subtle, not anything I would consider bad, and some I would argue are good. But God is a master at exposing how “good” can be the enemy of “great” if we will just listen. phone or video games are entertaining distractions but often at the expense of time that could be spent on more valuable longer term goals such as bible/prayer time (that ironically we so often say “I don’t have time for”. Helping ease the suffering of a friend created by their poor decisions only to risk circumventing God’s intention of strengthening them to stand on their own. So I’m sure you get the idea, immediate pleasure or desire or ours or another’s “ease” is short-sighted and misses the bigger picture. We long for things such as better health, deeper relationships or even a more authentic faith walk with God but how often do we try and shortcut the necessary manner in which those things become a part of our DNA instead of just striving for a wisp of willpower which quickly fades. 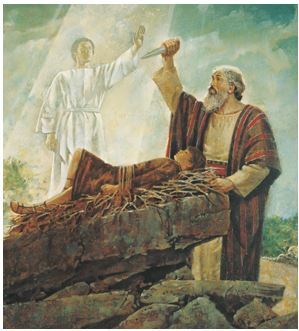 The story of Abraham and Isaac has always puzzled me. It’s easy to say God was testing Abraham’s faith, but to what end? God always has a point. Have you ever really considered what God was asking Abraham to give up? This wasn’t just his son, this was his promised son that he had begged God for and waited decades for. This was his only coveted son in marriage and the very fulfillment of God’s promise. Could there be anything more prized, cherished…. coveted. Could anyone fault a man for loving his son, especially one so deeply desired and being the fulfillment of God’s direct promise to Abraham. Why then would God make Abraham choose between Obedience to Him at the risk of loosing his most cherished son? What could this test possibly seek to prove? This morning I woke with the overwhelming sense that God desires above all else our response in all situations to be “God will provide for himself” (vs 8). So often we see that God does not reveal “how” things will turn out or “how” things will align to reach our desired goals, He only provides the direction we are to travel for Him. How many thousands of doubts, questions, whining or arguments would we have had if this task was posed to us? How many valid arguments would we readily utilize to convince ourselves there is no way God is asking me to do THIS?!?!? Do I prize the blessings from God more than I prize God himself? How can I become that obedient? How could I become so confident that a seemingly devastating request is actually coming from God? What in my life do I prize more than obedience to God? Is it my comfort? My prosperity? My pleasure? My possessions? A relationship? If God was calling me to a radical faith would I even consider it was from Him or simply blow it off as a ‘crazy thought’ and push it aside. I believe God’s testing was not just to see how Abraham handled the situation, but to expose how even the most worthy and prized possessions as our own family are at risk of replacing God in our own hearts. Is our desire for God or just seemingly godly-things? Nobody would question a man giving his life for his son, but how crazy to the world do we look when we are willing to give up our son for God? Or give up a high paying job to follow a calling, transplant our family from suburban America to a 3rd world country as a missionary, willingly step into skid-row on a regular basis to feed, clothe and pray with the broken and hurting, work long hours at community clinics, prisons or as case-workers for pennies just to come alongside the most wounded and forgotten in our communities. Our plans, our dreams, our goals, the things we toil with and worry about… are they about serving others and sacrificing for the advancement of the gospel? Or does my life revolve around my pleasure, my comfort, my desires? Do I petition God to meet my needs or am I praying for the wisdom, courage and strength to meet His?